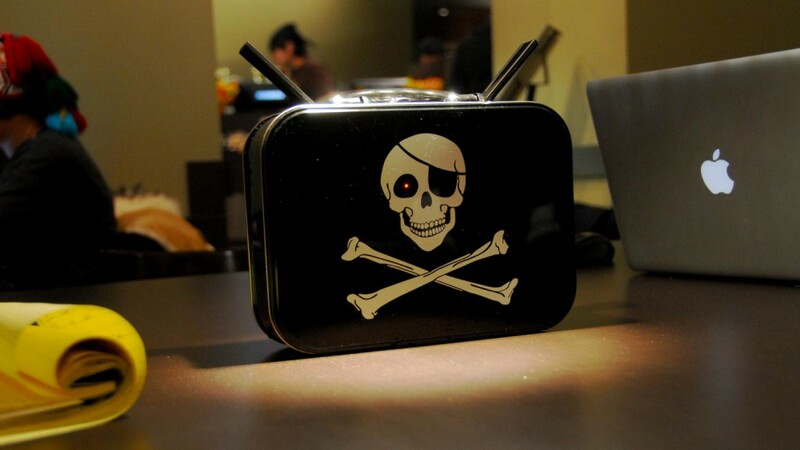 PirateBox is designed to be private and secure. No logins are required and no user data is logged. Users remain anonymous – the system is purposely not connected to the Internet in order to subvert tracking and preserve user privacy. PirateBox is free (as in freedom) because it is registered under the GNU GPLv3. This license grants you the right to freely copy, distribute, and transform creative works according to the principles of copyleft. You can learn more about modding your PirateBox by visiting the mods page and the PirateBox Forum. PirateBox is an anonymous offline mobile file-sharing and communications system built with free software and inexpensive off-the-shelf hardware. You can use it to transform any space into a free and open offline communications and file sharing network. The following instructions are for installing PirateBox 1.1 on a new TP-Link router (MR3020 or MR3040) or GliNet router which is running the factory installed firmware. Note: If you have already installed OpenWrt on your router or if you are already running an older version of PirateBox on your router, skip to the Upgrade PirateBox section below. If you have OpenWRT on a device other than the above routers, you can try your luck with the Manual method. For support, be sure to check out the PirateBox OpenWrt page and the OpenWrt discussion board on PirateBox Forum. Other You can find additional supported hardware on Hardware Recommendations page but please note that this hardware is not covered under this HowTo and thus your mileage may vary. USB Flash Drive (formatted FAT32 with a single partition). The Kingston DT 16GB works well: (Amazon)Note: a better-performing USB 2.0 flash drive is recommended, as a USB 3.0 drive may draw too much current, and a slower USB 2.0 drive may result in your PirateBox locking up during moderate-to-heavy or long-term use. Important: Be sure to use one of the OpenWrt images linked above! They are customized to work together with the install.zip. If you use a different image-file, you won’t be able to use this automatic installation! Extract the install_piratebox.zip file (double click on it) and drag the “install” folder over to your USB flash drive. Now SAFELY REMOVE your USB drive from your computer and plug the USB stick into your OpenWrt router. Set the toggle switch located beside the LAN/WAN port on the router to 3G mode, if a switch is available. Enter the default username & password (admin & admin). Note: For the GLiNet router you will need to select a language, time zone, and password. Select upgrade. Note: For the GLiNet router, you must make sure the flag “keep settings” is not ticked. After the upgrade completes, the router will restart.Important: You should wait 15-20 minutes for the installation to complete (for slower USB flash drives, it may take up to 45 minutes – be patient!). Your device will reboot a couple of times during the installation.Note: The Web Admin page for your router will “time out” during the installation process. This is normal and happens because the IP address for OpenWrt defaults to 192.168.1.1 which differs from the original Web Admin IP address for your router. Please do not try to visit 192.168.1.1 during the installation process as PirateBox is not shipped with a default Web Admin page and visiting this IP could interfere with the installation. You can now follow the Post-Installation instructions below to finish the installation. If you’re currently running an 1.0. * version of PirateBox on your router, these instructions should get you up and running in a flash (literally!). Please Note: The instructions below are specifically for the TP-Link MR3020, TP-Link MR3040, and the GLiNet routers. Note: If you’re currently running a PirateBox on your router with version 0.6 and below, you should follow the Update a very old PirateBox-HowTo. Drag the “*squashfs-factory.bin” file to your USB flash drive (you don’t need to extract this file first!). Connect your router via ethernet cable to your computer and power up the router. Note: Use your “tab” key at the end of “openwrt” to autocomplete the full file name of the firmware. After the upgrade completes, the router will restart twice. Wait patiently! Turn off the router and plug the USB flash drive into your computer. Extract the install_piratebox.zip file (double click on it) that you downloaded earlier and drag the “install” folder over to your USB flash drive. Power the router on. This will trigger the installation of the new packages. Note: You should wait 15-20 minutes for the installation to complete (depending upon your USB flash drive, it may take up to 45 minutes – be patient!). Your device will reboot a couple of times during the installation. Once you have installed or upgraded PirateBox, you can follow these final steps to set a password, activate the Kareha Image and Discussion Board and configure and start the UPnP media server. Create a password for the administrative root access. Choose “Option 1”, then enter your password twice. Notice: It is not shown while entering it. Activate the “timesave function” by selecting “Option 2” and entering the current date and time. Enter your password, after you are promted, then you are done. Note: Any media files uploaded to your PirateBox will now automatically stream across your PirateBox wireless network. You will need a UPnP client in order to play these files. Check out our Streaming Media page for more info.